There are so many books on mixing colors, it’s hard to imagine finding anything new on the topic. But when I read this to my kindergarten students, they loved it so much, I had to study it more closely! Because monsters love to make new colors! Celebrate along with the hilarious monsters in this wild and energetic picture book from author-illustrator Mike Austin. Mixing and discovering color has never been so much fun! 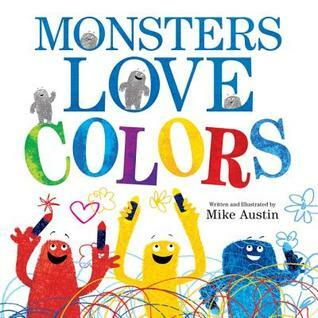 Monsters Love Colors was written by and illustrated by Mike Austin. It was published in 2013 by HarperCollins Children’s Books. This book showed me the value of fun word play for connecting with young children. I loved the rhyming associations with the colors: “Red is the color of ROAR! And SNORE! And more! more! MORE!” There are funny asides with bits of monster dialogue and a wonderful over-the-top moment at the end. I found the scribble art style worked well to bring out the wild, creative spirit of the cartoony, kid-friendly monsters. There is a lot more to this book than I realized at first. Different discussion points could be highlighted, depending on your lesson focus. As well as teaching about colours and colour mixing, it also shows individual differences (each monster has their own favourite color and that’s okay) and how art is about playing and being creative (scribbles can be art too). After reading this book and seeing how my students reacted to it, I want to look for Mike Austin’s second book, MONSTERS LOVE SCHOOL. Choose an interesting word from the book (e.g., growl, roar) and create a piece of art to go with it. Draw a scribbly monster for your favourite colour and think of some words to describe it. For example, Purple is the colour of…. Experiment with paints and crayons to make your own new colours. Invent a rainbow with your own creative colors. Sounds like a great book. Love the colorful cover.